The rooms in Istanbul's Sisli courthouse are tiny. There is barely space for a single wooden spectators bench squeezed between battered metal filing cabinets. But on Friday one of these rooms will be the setting for a test case for Turkey. Turkey's most internationally-acclaimed novelist will go on trial here charged with "insulting Turkishness". The charges relate to a magazine interview in which Orhan Pamuk said 30,000 Kurds and one million Ottoman Armenians were killed in Turkey and no-one dares talk about it. He could face up to three years in jail. This high-profile prosecution has caused a stir in Brussels. It has raised serious concerns about EU-hopeful Turkey's commitment to the basic democratic principle of free speech. A delegation of MEPs will travel to Istanbul to observe the trial alongside international human rights campaigners. 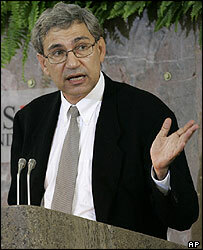 Orhan Pamuk fled the country after the interview was published amid what he calls a hate campaign. Now he is back, determined to use his time in court to defend his comments, and his right to make them. "What happened to the Ottoman Armenians in 1915 was a major thing that was hidden from the Turkish nation; it was a taboo," the writer explains, at an Istanbul cafe overlooking the waterfront. "But we have to be able to talk about the past." Armenia insists its people were victims of a genocide nine decades ago; Ankara denies any such thing. Turkey implemented wide-ranging legal reforms as part of its bid for EU membership. But the new penal code still contains tight restrictions on what you can write and say. Under Article 301 it is illegal to insult Turkishness, the Republic or most state institutions. It is left to the prosecutor to decide what exactly constitutes an insult. "The government is keeping this law to hit whoever criticises or bothers them," Orhan Pamuk believes. "If that person is not internationally known they are going to punish him and put him in prison. Article 301 should definitely be changed if Turkey rightfully - and hopefully - is to join the EU." There are currently more than 60 writers and publishers besides Orhan Pamuk on trial in Turkey for what EU officials call their non-violent expression of opinion. Ragip Zarakolu is one of them. He has made it his mission to expose Turkey's hidden history - a decision that has earned him the dubious honour of "most persecuted publisher in Turkey". "We must face these realities to become a real democratic country. We are giving a struggle for this, to give light to the dark pages of our history," Ragip Zarakolu explains, watching his latest book roll-off the printing presses. "Some conservative, nationalist and even fascist circles are very disturbed by this, but we are in need of it. Not for the Armenians or any others - but for citizens of Turkey." The strict taboo on the fate of the Armenians was cracked last September when Bilgi University hosted a controversial academic conference. Nationalists and staunch conservative protesters gathered outside the gates to shout their anger, convinced the event was sponsored by Turkey's enemies abroad. One group succeeded in getting the conference suspended temporarily - the same self-styled guardians of Turkishness who filed the complaint against Orhan Pamuk. "He overstepped the mark," insists group leader Kemal Kerincsiz, adding proudly that his association has also filed charges against eight other writers. "Pamuk is a literary figure, but he made political comments that were ill-informed, untrue and anti-Turkish. We acted on behalf of all society. Orhan Pamuk should not have played with history, and with the sentiments of Turks." Like many here, the novelist himself sees the writers' trials as just one battle in a bigger war between competing forces in Turkey. The noisy street protesters are just the foot soldiers. "I think the bureaucracy is resisting Turkey's entry to the EU," Pamuk explains. "The right-wing, highly-conservative bureaucracy is upset by the freedom of speech that Turkey, the nation, is granting itself. I think in the long run Turkey will continue its road to the EU but it's getting to be a big trouble these days." Friday's trial has thrust a reluctant Orhan Pamuk into the role of political symbol. Now in the international spotlight, he says he feels responsible for less well-known writers suffering the same fate. But the novelist admits he longs to return to his books more than anything. "I feel this political responsibility, a solidarity with all these people who are being harassed. I am with them," he says. "But sometimes I think - am I losing my naiveness? Is the child in me - who wants to write novels - dying as I get more and more involved in politics? I don't think so - I will get out of this with dignity, soon." Turkey and the EU will be watching his case closely to find out.